NEWARK, Calif.--(BUSINESS WIRE)--Today Logitech (SIX: LOGN) (NASDAQ: LOGI) unveiled the Logitech® Bluetooth® Multi-Device Keyboard K480, the first desk keyboard designed for use with up to three devices, regardless of computing platform. Now you can type a report on your computer and, with the flick of the Easy-Switch™ dial, respond to a message on your smartphone and type a tweet on your tablet. The universal keyboard can connect to three different Bluetooth wireless devices at once, whether you are using a Windows®, Mac® or Chrome OS™ computer, or an Android™ or iOS tablet or smartphone. You can type in comfort on a full-size desk keyboard with a familiar layout and all the shortcut keys you use the most. The durable, integrated stand firmly holds your phone or tablet at just the right angle for you to read while you type. With a choice of two color schemes, the keyboard is designed to blend into your home decor without sacrificing style. 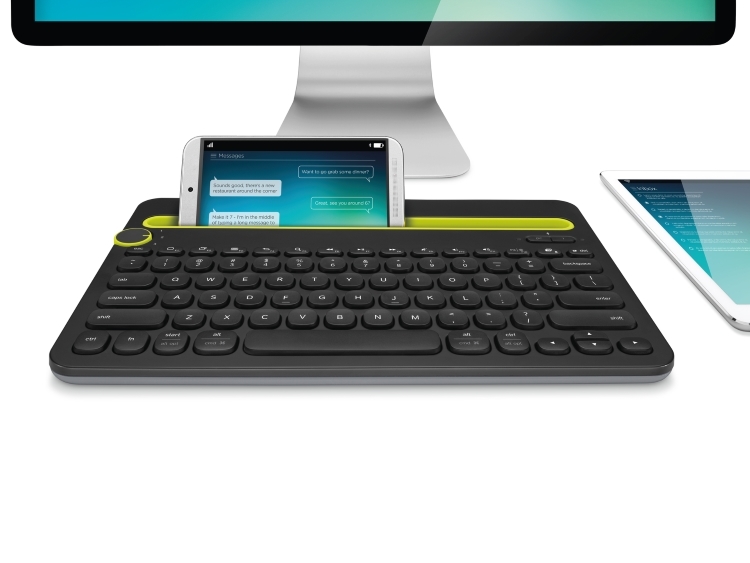 The Logitech Bluetooth Multi-Device Keyboard K480 is expected to be available in the U.S. and Europe beginning in September 2014, for a suggested retail price of $49.99. For more information, please visit www.logitech.com/news/K480 or our blog.